In our first millennial-focused article, we introduced and explained who millennials are and what makes them different from other generations. To sum it up, the term millennial, also known as Generation Y, refers to anyone born between 1981 and 1998, currently age 18 to 35. Millennials are not afraid to speak up. We have opinions and we want you to know about them. Millennials grew up believing we could accomplish “anything” and that even if our ideas are not jaw dropping, they are at least worthy of being heard. When it comes to millennials, communication is key. Our can-do attitudes provide the way of thinking that we can accomplish anything we set our minds to. An employer wanting to successfully get the message across and maintain a positive relationship with millennial employees should adopt a coaching approach rather than that of a boss. In an article posted on Inc.com, Bill Murphy Jr. quotes Jim Clifton, chairman and CEO of Gallup, as saying that millennials care about having managers who can coach them, who value them as both people and employees, and who help them understand and build their strengths. Be direct if they are doing something wrong and they will be more responsive and more willing to correct mistakes. Doing this shows that you care that they completely understand where they need improvement because you, as their boss, want them to stick around. And, as an employer, if you’re going to hire millennials or people straight out of college, be prepared to teach your employees and answer their questions. Millennials are ready and eager to learn, but they don’t know it all yet (even though our parents think that we think we do). Millennials want a tight bond with a boss that is thoughtful and aware. According to BusinessKnowHow.com, loyalty to the boss is the number one reason millennials stay in a job, especially in the first three years, and dissatisfaction with the boss is the number one reason they quit. While millennials understand the order of hierarchy and respect the boss, they really strive to make valuable contributions to the team. This leads to another point – millennials love working in teams and accept that there is no “I” in TEAM. Millennials believe that a team can accomplish more than a lone ranger, so use this to your advantage and create a team-oriented work space where they can thrive. Create opportunities for social interaction among employees by celebrating birthdays and work anniversaries or plan outings to laser tag or bowling – show that you care that your employees enjoy working there. This group grew up during the technological revolution. Most of us remember listening to cassette tapes, carrying portable CD players and watching VHS tapes (and the inconvenience of rewinding them), but millennials were also witness to the development of MP3 players, smart phones and tablets that created an instantly gratifying world that has shaped us to process information quickly, learn fast and adapt even faster. We grew up with the ability to figure things out on our own, whether it be via Google or texting someone who’d know the answer. Many studies show that millennials prefer text and email over voice calls – in fact, they would be willing to delete voice calls entirely if that were an option! Click to read more on this in my article I’m a Millennial: Don’t Call Me. Millennials multi-task like nothing you have ever seen before. They enjoy a challenge and working on multiple projects at a time with “10 times the speed and technical knowledge than their older siblings,” according to BusinessKnowHow.com. Multi-tasking among millennials may have started with watching TV while responding to AOL Instant Messenger after school, but it has evolved into something considered a strength in today’s work force. Need an employee who can respond to emails and IM’s while taking notes in a client meeting? Call, I mean text, a millennial. Millennials are less concerned with the number on their paycheck and more with having the time to fill their weekends with different adventures and activities. Money is important of course, and millennials believe that their paycheck should reflect their work contributions, but the main driving force is having time to spend with family and friends doing things that are important to them. Offering flexible work schedules, a relaxed workspace and paid time off are just a few examples of how to accomplish this. Every other week, the mRELEVANCE team enjoys “work-from-home Wednesdays,” providing a break from commuting to an office and the convenience of working from essentially anywhere. Many employers worry that their employees would take advantage of this situation, but don’t. We love having options and will not do anything to have said options revoked. 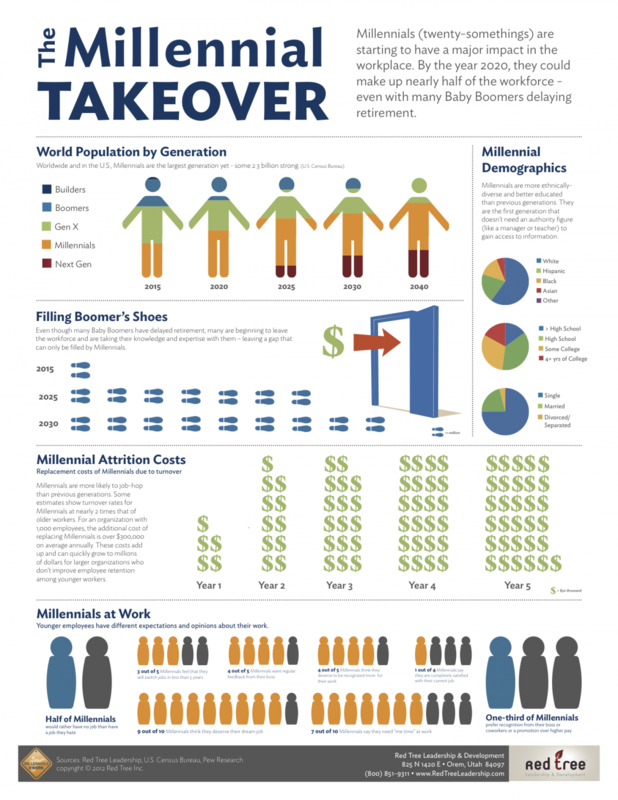 mRELEVANCE understands both the struggle and the success of working with millennials by having a multi-generational team. The fact of the matter is, the millennials are coming – are you ready? Stay tuned for our next “Millennial” installment. For more information about what mRELEVANCE can do for your business, fill out the online contact form or visit www.MarketingRELEVANCE.com.